I spent quite a bit of time this weekend baking and cooking. Never had any intention to do so, it just sort of happened. I had lemons and blueberries that needed to be used up, I woke up at 3:30 am Saturday morning and could not fall asleep again, despite my valiant efforts to sleep in, so I made bagels. However, the inspiration for this mornings quote came in the form of a sweet nectar that I finally got up the courage to make. I've long been a fan of Anne of Green Gables by L.M. Montgomery. The writing in the books makes you feel as if you were there experiencing Prince Edward Island with Anne: the sights, smells, sounds and tastes. How could you not feel for her when for a time she loses her "bosom friend" Diana because she served Marilla's famous Current Wine instead of the Raspberry Cordial as was intended? 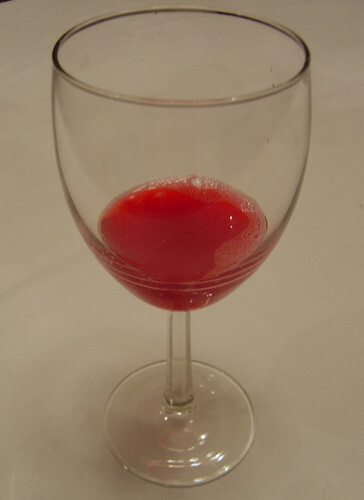 Marilla's Raspberry Cordial and Current Wines have always fascinated me. After thinking about it several times through the years, I actually remembered I wanted to try making Raspberry Cordial while I was at the grocery store and able to pick up what I would need. I stuck to a non-alcoholic version similar to what Anne and Diana would have had, assuming they grabbed the right bottle. I used a bit less sugar than what is called for by most recipes, but it was still plenty sweet. Oh and so delicious! The books of Enid Blyton also hold countless treats I'd love to find recipes for sometime. Jane Brockett wrote a book of recipes for treats found in childhood books called Cherry Cake and Ginger Beer, it's been on my wishlist for a while and sounds like it would be a treat to match the descriptions from stories with the treats themselves. What treats from books have always fascinated you? Anything I should try? Bring water, raspberries and lemon juice to boil in 6 qt stock pot. Simmer for 45 minutes, reducing to between 4-6 cups of liquid. Strain through cheese cloth, returning liquid to stock pot. Add sugar to liquid in pot, simmering until dissolved. Pour liquid into 64 oz container, add cold water until full, cap and shake to mix. Ah, Anne of Green Gables. I just love those books.